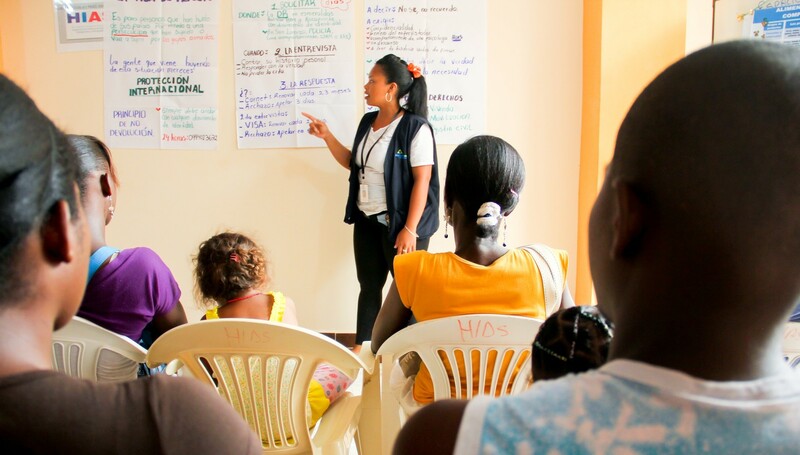 An Asylum Access volunteer teaches displaced Colombians about their rights as refugees in Ecuador. For Latin America and the Caribbean, 2016 was no ordinary year. The signing of the peace accord between the Colombian government and the FARC and the passing of Cuba’s dictator, Fidel Castro, were among the seminal events that will shape the political landscape for years to come. Significant developments in regional bodies reflected deeper changes in the hemisphere’s commitment to democratic governance and principles. Under new leadership, the Organization of American States (OAS) for the first time invoked the Inter-American Democratic Charter against the Venezuelan government for the systematic alteration of the country’s constitutional order. The new leadership in the OAS and Mercosur has shown a determination to reassert the organizations’ roles as institutional safeguards for democracy and human rights in the Americas. The region overall, however, continues to face broad challenges. The erosion of democratic institutions stemming from non-democratic governments, corruption, and transnational organized crime is ongoing. In 2016, human rights defenders, environmental and community activists, journalists, and media owners were harassed and even murdered by hostile federal and local governments and criminal actors. In the face of these challenges, NED grantees continued to work fearlessly to advance human rights and improve democratic governance. After many obstacles and delays, Haiti finally held presidential elections. Jovenel Moïse – who was former President Martelly’s handpicked successor – won with more than 50 percent of the vote, averting a run-off. Yet unresolved electoral tensions coupled with weak and fractured civil society and media sectors do not bode well for Haiti’s democratic stability. NED supported programs encouraging the participation and inclusion of youth and women in civic and political spaces, increasing citizen oversight and demand for human rights and the rule of law, and fostering dialogue and conflict mediation as an avenue to resolving political differences. Support for Mexico’s current administration has been weakened by corruption, human rights violations, and failure to halt organized crime, which have stalled the government’s reform agenda. NED grantees worked to assist victims of human rights violations; promote access to information and oversight of government institutions; and foster the political inclusion of vulnerable groups. Guatemala has regained some stability after an intense period of citizen mobilization and judicial activism in 2015 that resulted in the resignations of numerous government officials. In addition to significant challenges to transparency and accountability, Guatemala struggled with some of the highest homicide and citizen insecurity rates in the region. In 2016, the Endowment supported civil society organizations that promoted government transparency and accountability, citizen oversight of social programs at the national level, and environmental justice in the Petén region of the country. Honduras also faces extremely high levels of violence, citizen insecurity, and corruption, as well as widespread poverty. NED-funded programs focused on promoting dialogue and consensus building among different political and social actors; engaging youth leadership on conflict prevention; citizen monitoring of the legislative process; access to information; and government transparency. Nicaragua experienced a significant regression toward authoritarianism in 2016. In anticipation of the November 2016 presidential and legislative elections, the Ortega-controlled Supreme Court stripped the main opposition coalition of legal representation and all opposition parliamentarians were removed from their seats and replaced by government loyalists. Ortega appointed his wife as his vice-presidential running mate, and both competed virtually unopposed and with no international or domestic electoral observation. NED supported initiatives that helped democratic forces defend democratic space in Nicaragua, encouraged greater participation of women and youth, sustained freedom of expression, and promoted civic values. In Argentina, the government achieved a major victory with the September 2016 approval of the country’s first access to public information law, which will enhance government accountability and transparency. The new government has pledged to uphold international human rights and democracy standards, and NED partners are optimistic that this is an opportunity to strengthen democratic institutions, including restoring an independent judiciary and the rule of law, promoting transparency, and sustaining democratic efforts throughout the region. In Bolivia, President Evo Morales lost a referendum that would have allowed him to run for a fourth consecutive term. However, the government continued to restrict space for civil society participation, while the economic downturn led to an increase in social protests. NED partners focused on promoting the rights of women and indigenous peoples, media independence, independent socioeconomic analysis, and political engagement among youth. After 60 years of armed conflict, the Colombian government and the FARC reached an agreement for peace. In response to these developments, NED partners began to focus on programs for a post-conflict era, which includes projects to oversee the implementation of transitional justice mechanisms; promote anticorruption initiatives at the local, regional, and national levels, as well as civic education and leadership initiatives targeting Afro-Colombians and indigenous populations. In addition, the Endowment continued to sustain innovative digital platforms promoting investigative journalism to inform citizens about local and national politics. In Ecuador, the administration of President Rafael Correa continued to concentrate power in the executive branch and limit the independence of the legislature and the judiciary. NED supported organizations that monitored violations of human rights and freedom of expression, provided independent news and information, worked to increase the transparency of the judiciary, and promoted government accountability at the local level. Paraguay continued to face numerous challenges to its democratic development that contributed to low support for democracy and a low level of citizen interest in politics as a whole. NED sustained organizations focused on enhancing transparency and accountability, improving access to justice, fostering youth participation, and promoting the consolidation of the country’s emerging civil society.